The Chassis-based Media Converters include a number of independent media converters and a chassis capable of housing upto 16 media converters. You can start with single media converters,each equipped with its own housing and AC power adapter. When your requirements grow big, you can mount a chassis in your equipment rack and install your media converters in the chassis. The housing of each media converter can be easily removed, and the media converter PC board can be slid into the chassis. 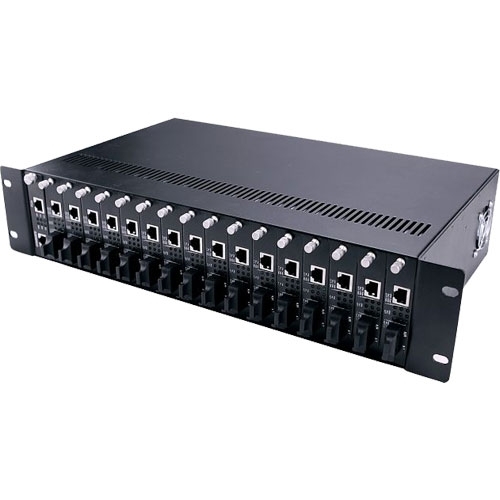 The chassis lets you install multiple media converters in an equipment rack together with the network devices for which they provide media conversion. This provides for space saving, and the cabling will look neat. The chassis comes with its own universal AC to DC power supply. For maximum power availability, an optional redundant power supply is available for installation in chassis. FiberOpticCable.com supply two types of rack-mounted chassis for unmanaged media converters : 2-U 14 slots media converter chassis and 2-U 16 slots media converter chassis. The 14 slots media converter chassis supports plug-and-play installation of stand-alone media converters convert modules. It can hold at most 14 pieces media converters. The 16 slots media converter chassis media converter chassis should be used with card-type media converters. The 16 slots media converter chassis can hold at most 16 card-type converters of 10/100M.